A 45 year old gentleman presents after 2 days of “indigestion” with a STEMI. He is admitted to ICU due to hypotension and an arterial line and pulmonary artery catheter are inserted. There are ongoing broad complex arrhythmias and urine output is poor. The first cardiac index is 1.5 l/min/m2 and the treating intensivist requests an echo…. 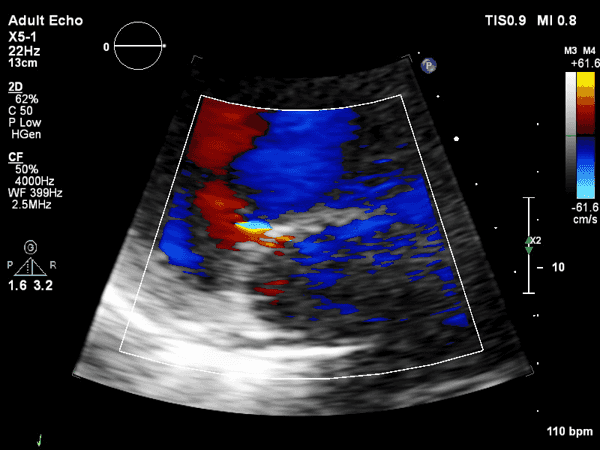 Mitral valve with colour flow Doppler. Why does the degree of mitral regurgitation vary? Mitral regurgitation increases during the runs of broad complex tachycardia. Although the valve morphology itself does not change, loading conditions and the function of the supporting structures of the mitral valve are influenced by this arrhythmia. This may result in increased regurgitation. PLAX (off axis). Which segments demonstrate regional wall motion (RWMA)? 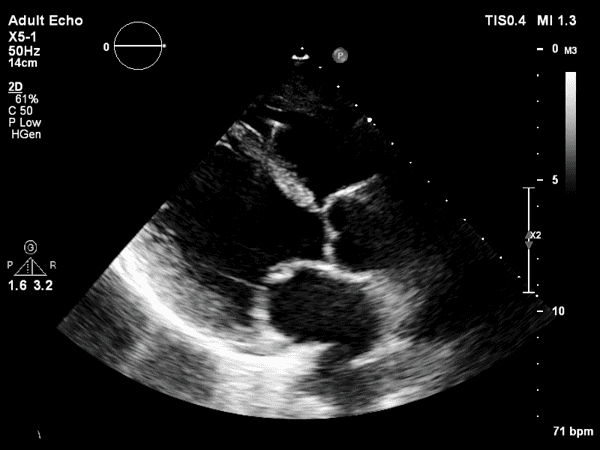 What is the object seen in the right ventricle? Decreased motion and thickening of the anteroseptum is seen, contrasting with relative preservation of the inferolateral wall. The object seen in the right ventricle is a pulmonary artery catheter. It is associated with a ring-down artefact (a type of reverberation artefact). 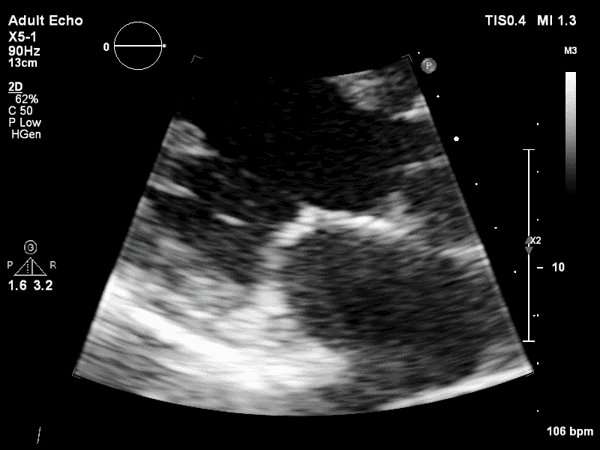 X-plane through the basal LV, showing a SAX view of the mitral valve. Compare the function of the anterior and inferior walls. Owing to the poor cardiac index (1.5 ml/min/m2), adrenaline was commenced at 5 μg/min. 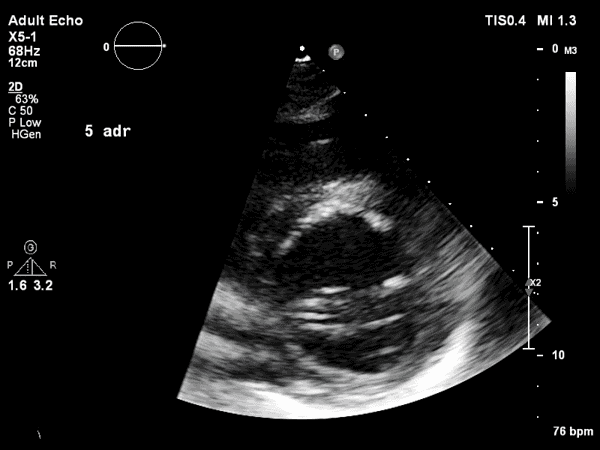 What change is seen in this PSAX at the mitral level? Recruitment of the inferior segments, with minimal change in the anterior segments. The LV function improved from severe to moderately decreased overall (3DEF 37% on adrenaline). The findings are summarized in this apical 2 chamber view, demonstrating poor function of the anterior wall and preservation of inferior wall function. Why is the apical inferior segment involved? It’s likely that the involved coronary artery is the LAD. This frequently supplies the entire apex of the heart. Echo is indicated where hypotension is of suspected cardiac origin, particularly post MI (ASE 2011 Appropriate Use criteria). 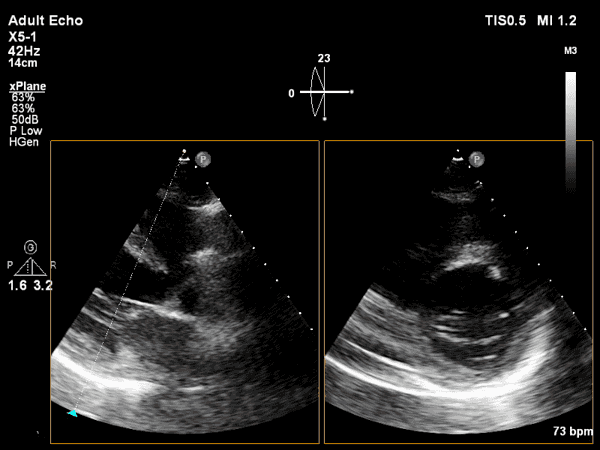 In this case, an LV regional wall motion abnormality was found as expected. 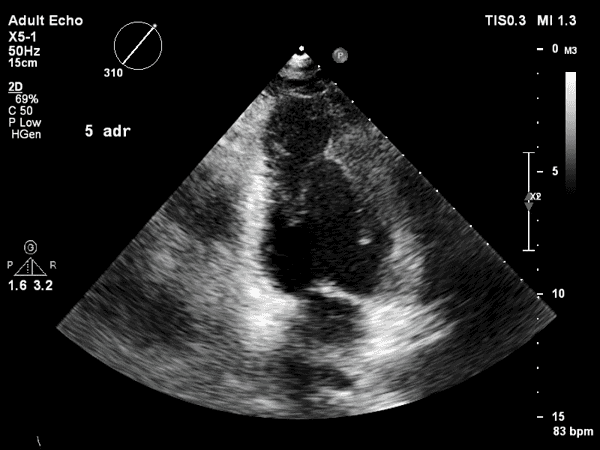 Hypotension post MI may also be due to complications such as RV failure, VSD, papillary muscle rupture with acute mitral regurgitation, and tamponade – which may be detected with echo.